Whether you're tailgating or exploring the great outdoors, enjoy a warm drink to get you started and keep you going. Say sayonara to the high temperatures and humidity, and wave hello to chilly mornings and crisp breezes — it's definitely fall! And with jacket weather comes a whole new season of outdoor activities that call for a toasty beverage. 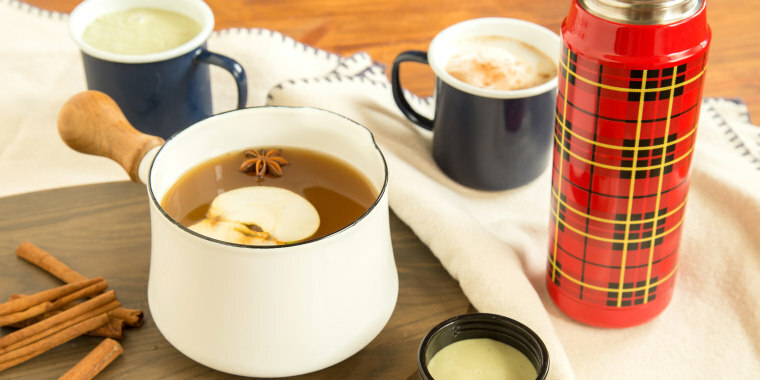 Here to warm hands (and hearts) this season are delicious autumn drinks that can be sipped at home with friends and family or easily packed into an insulated beverage container for tailgating. Each of the following fall drink recipes can be made with or without alcohol and makes about two substantial servings. Make them as is for an all-ages sipper, or add in the optional booze pairings to spice things up for grown-ups. If taking these drinks to-go is the plan, stir the ingredients together just before it's time to hit the road so they'll stay warm all day. Bring 2½ cups of apple cider to a simmer and add three chai tea bags. Remove the cider from the heat, cover it and let it steep for 30 minutes. Whisk in 1 tablespoon vanilla extract. To make it boozy, whisk in ¼ cup of apple brandy or apple whiskey with the vanilla. Whisk together 2 tablespoons of granulated sugar and 2 tablespoons of matcha powder together in a bowl. Heat 1 cup of regular coconut milk and 1½ cups of any other milk of your choice (regular, rice, almond, etc.) over medium-low heat. As soon as the milk comes to a simmer, remove it from heat and whisk in the matcha blend. To make it boozy, whisk in ¼ cup coconut rum after the matcha is blended. Whisk ½ cup of whole or reduced-fat milk, 3 tablespoons of maple syrup, 1 tablespoon of chocolate syrup and ¼ teaspoon of cinnamon together in a saucepan over medium-low heat. As soon as the milk comes to a simmer, remove the mixture from the heat and whisk in 2 cups of freshly brewed coffee. To make it boozy, whisk in ¼ cup of maple whiskey or spiced rum with the coffee. In a small pot, combine 3 cups of cold water with the juice of one lemon, 1 tablespoon of honey, two cinnamon sticks and two star anise pods. Bring it to a simmer, then remove the pot from the heat. To make it boozy, add 2 ounces of bourbon, rum or gin. In a small pot, combine 3 cups of apple cider, the juice of one lemon, 1 tablespoon of honey, two cinnamon sticks and two star anise pods. Bring the mixture to a simmer, then remove it from the heat. To make this drink boozy, simply add 2 ounces of bourbon.